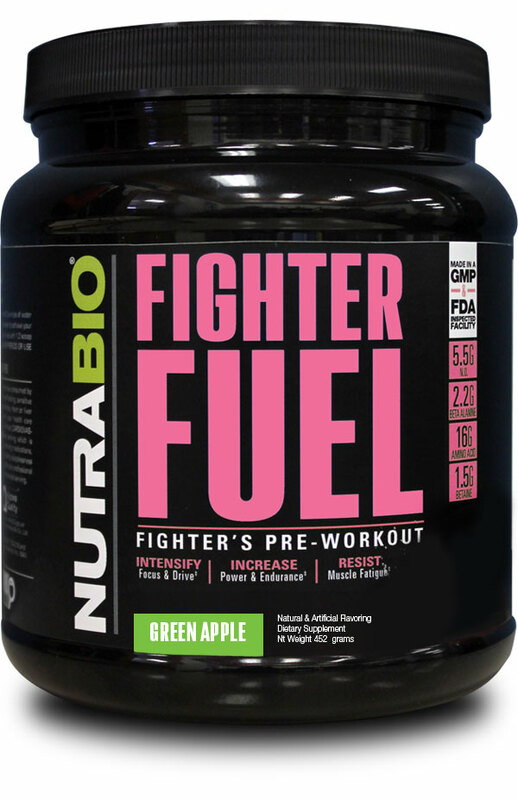 NutraBio’s brand new Fighter Fuel version 3, the powerhouse pre-workout, packed with an all new formula and two new delicious flavors, is now available in a women’s specific formula. Women’s Fighter Fuel is a pre-workout supplement designed to supercharge training intensity and provide continuous, steady energy throughout your workout. It is scientifically formulated to deliver the vital nutrients required needed to increase muscle strength and endurance, build resistance to muscular fatigue, improve mental focus and intensify workouts so you can train harder and longer. Fighter Fuel v3 has been reformulated based on the latest scientific research and case studies to contain even more of the ingredients that are clinically proven to deliver results without compromise. One of the major changes in the formulation, is the increase in Cyclic Dextrin from 15g to 19g per serving. In recent studies, Cyclic Dextrin has shown measurable improvements in athletic performance, proving that it is truly the ultimate carbohydrate for clean energy without any insulin spike or stomach discomfort (click here to learn more about Cyclic Dextrin). Two new flavors – GREEN APPLE & RASPBERRY LEMONADE are introduced with the launch of the new version 3 and make this new formula taste amazing. We are excited about both new flavors but so far Green Apple is getting all of the attention from the team. These new flavors are greatly improved from previous versions and this is the total package – a pre-workout that does exactly what you want it to do, doesn’t do what you don’t want it to do and also tastes amazing.With these two new flavors and brand new formulation, you may expect a price increase. Just the opposite. The price for this premium pre-workout has decreased from $46.99 down to $43.99. For more info on Fighter Fuel v3 in Men’s and Women’s, please click here. This entry was posted in Supplements and tagged FIGHTER, MMA, cyclic dextrin, fighter fuel, pre, preworkout by NutraBio Labs. Bookmark the permalink.